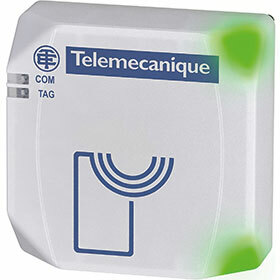 RS Components has announced the availability of OsiSense XG smart RFID-tag antennas from Telemecanique Sensors. These new devices target access control use in industrial machine and control panel applications, as well as deployment in production workshops or traceability systems. Using RFID cards to determine authorised operations, these types of systems are increasingly being used as a method of product tracking and as the replacement for traditional barcode or electromagnetic systems. Delivering better security due to operator and tool identification, the Telemecanique OsiSense system can offer profiled access: for example, enabling the display of information according to the operator’s profile, such as whether they are a manager or a maintenance operator. The OsiSense XG system operates at 13,56 MHz and uses tag readers that are read/write compatible with almost all tags conforming to ISO 18000-3, ISO 15693 and ISO 14443, which is the vast majority of 13,56 MHz tags on the market. Offering a typical life of 2,5 million write cycles and unlimited read cycles, typical sensing distance of the RFID-tag readers is from 10 to 70 mm. Featuring integral antennas and simple installation, the OsiSense XG smart tag readers do not require software or specific programming and can be mounted easily on a panel through a standard 22 mm hole. In addition, they are small with dimensions of only 40 x 40 x 39,5 mm, and feature robust sealing up to IP69K. Industry-standard M12 connectors can be used for incorporating the smart readers into industrial networks or other equipment and systems.